My favourite of the windows was this one from Guerlain. I loved the hanging filigree shelves and the mix of cascading orchids and wild greens. One of the highlights of spring is attending the David Jones Spring Flower Show with my Mum. The Elizabeth Street Store is filled to the brim with a profusion of floral delights and each window is a new and creative vision to admire. Cherry blossoms and a field of roses make for a classic feminine scene celebrating Chloe's Perfume. Illuminated Prada perfume bottles were a statement on the overall theme of the flower show - luminescent but I kept being distracted by the drama of this display. Those yellows and purples and the different flower and leaf shapes all worked together to create a lot of impact. The corner of Market Street and Castleraegh Street was dedicated to Chanel. A small scene of the house of Chanel was lit up and illuminated with changing hues and colours as the sun and moon made their traverses. The streetlights were lit up for a night scene before rosy pinks bathed the little Paris streetscape as the sun rose on another busy day at the atelier. Though those seamstresses in the upper windows were working through the night too! The theme for the David Jones Flower Show this year was Luminscent. Attending the opening night was the perfect opportunity to appreciate some of the particular night features of this years display. There were secret windows and inside a secret tunnel lit with glowing blue bell like flowers - surreal and dreamy like neon jellyfish in the deep sea. Luminscent made for an interesting theme and I liked the play on words between the illumination of the flowers and the scent of flowers and perfumes that the windows celebrated. Dessert blooms and succulents of all shapes and textures make for an interesting corner window display on the Elizabeth street Market Street corner promoting a new scent starring Johnny Depp as its brand ambassador. This window showcases how just 3 elements can still create a massive impact of texture and drama when composed beautifully. Moving inside the store the mass array of flowers continues with towering arrangements of twigs and sprawling florals. The windows are always wonderful to look at, but I always think there is something special about the flowers that fill and dominate the ground floor inside. 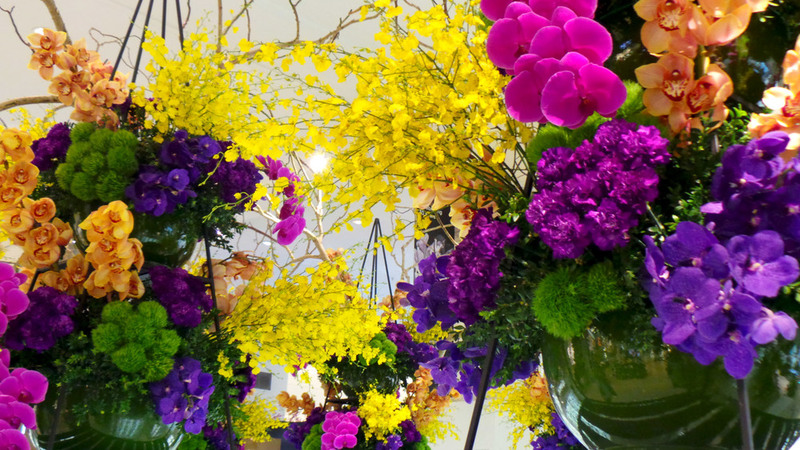 The shopping space is transformed by this mass array of colour and you can get up close to the blooms and really admire the different flowers and leaves used in the arrangements. How amazing are these contrasting bright colours? I particularly loved the contrast of the gum branches against this muted gold planter box. Seeing all the cherry blossom branches made me sigh as it reminded me of all the amazing cherry blossoms we saw on our last trip to Japan. I also loved the contrasting colours with the ceilings of the store, particularly the gold. Overall its hard not to go crazy taking lots of photos of all the different flowers and arrangements - such an amazing variety of flowers to inspire! A fabulous cluster of assorted yellows and shapes - how can you not be inspired by this rich variety of floral beauty?